In 1944 Paul Lazarsfeld, (1901-1976) an American Social Researcher, Bernard Berelson (1912 – 1979) and Hazel Gaudet was introduced The Two-Step Flow of Communication in the book called “The people’s choice: How the voter makes up his mind in a presidential campaign. New York: Columbia University Press”. The purpose of the study was focused on Presidential election Campaign and the people decision-making process towards the campaign. All three researchers were wanted to find out practically whether the mass media messages affect direct influence in voting decision among the people. Unexpectedly they found the media messages (like radio and newspapers) are very less influence then an informal, personal communication on voting behavior. 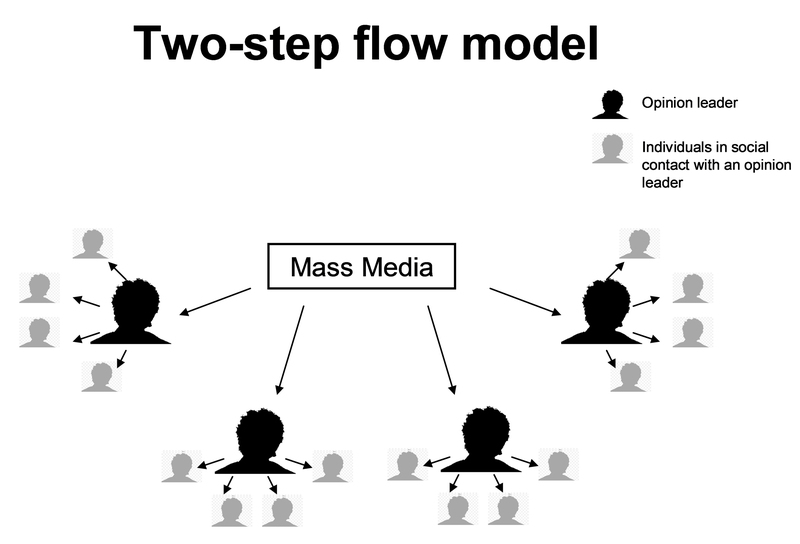 Based on this researched data, The Two Step Flow Communication Theory of Mass Communication was developed by Katz and Paul Lazarsfeld. Opinion Leader is a leader for a certain group who gives details and information to lesser active persons in the group. In office, the managing director is an opinion leader and in public, a political leader is an opinion leader. They interpret the information to their own group. But one thing the Opinion leader is a leader only for their own group not for all. In Public, Political leader is an opinion leader. Here few people are not influenced by the leader and their political views and thought. These people won’t support opinion leaders and isolated from the population. Katz and Paul seems “the flow of media messages from radio and print to opinion leaders and then the leaders leads the messages to lesser active users in the population”. Through this transformation of message, the leaders may add their opinion on the actual content which may affects the low active users. In some cases the Opinion leaders are filtering the actual content ensures the information is needed by the people. Mostly the opinion leaders are selective and they pass the messages to the group. (Low-end media users: Poor, Worker and People who are not affordable for getting information directly). Note: The Opinion leaders have enough voice only in structured social groups not in an isolated individual in the population. Carol watching News in ANB Channel they flash the headlines with “Research reveals some toys are leads the children’s aggressive and Violent”. That day Carol calls her little son and went for shopping and carol warn her son some toys are not good and made skin allergy which leads her son to avoid those toys. -Researchers found substantial evidence that initial mass media information flows directly to people on the whole and is not relayed by opinion leaders. -The two-step hypothesis does not adequately describe the flow of learning. Lazarsfeld and his associates in the 1940 election study were unable to determine the specific flow of influence. – Today most of the advertising researches are based on this theory. Especially opinion leaders role in the society as well as in home to which helps to improve the market with less efforts. It is helpful and easy to understand, thanks. It was a helpful article. i like this article, its simple to understand. Very simple and very easy to understand..
One of good ethic point has been mentioned here with suitable examples which not only helps a communication scholar but also in an informative perception it creates nice view of study.